If just one unhealthy habit was changed during Wayne County’s health expo on Wednesday (May 16), then it can be considered a success. But based on the turnout, chances are high that a lot more than just one person received some life-changing advice. A few thousand people showed up at Cobo Center for the sixth annual “Free Health Expo for the Uninsured,” an event that focused on providing access to free and low-cost healthcare to those without insurance. Attendees were invited to take part in a number of health screenings — including blood pressure, body mass index (BMI), cholesterol, glucose and stroke risk assessment — and were offered information on topics ranging from diabetes to care for the elderly. During the event, WDIV Channel 4 anchor and ER surgeon Frank McGeorge emceed a brief presentation that highlighted the key components of the day. Additionally, Detroit resident Charles Brown gave a speech about how attending the expo helped detect a chronic illness and ultimately saved his life. His sentiment was reflected by Mary Mazur, the Director of Communications and Community Collaboration for Wayne County and a key organizer of the event. Speaking about the importance of health care access, she reiterated the event’s purpose and importance. Didn’t make it? 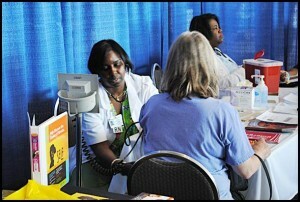 The county will host another health expo on June 14 at the Inkster Recreation Center. For more information visit www.waynecounty.com/hha or call 1-800-WELLNOW.